The OM-USB-1608G Series devices are low-cost, high-speed, analog and digital I/O USB devices. All of these devices offer up to eight differential (DIFF) or 16 single-ended (SE) analog inputs, up to eight digital I/O channels, two counter inputs, and one timer output. The OM-USB-1608GX-2AO offers two, 16-bit analog output channels with DAC rates up to 500 kS/s. Everything you need to begin acquiring, viewing, and storing data is included with each OM-USB-1608G Series device, including comprehensive software support. (OM-USB-1608GX-2AO only) The OM-USB-1608GX-2AO has two 16-bit analog outputs. Both outputs can be updated at a rate of 250 kS/s per channel; one output can be updated at a rate of 500 kS/s. The output range is fixed at ±10V. The outputs default to 0V when the host PC is shut down or suspended, or when a reset command is issued to the device. OM-USB-1608G Series devices have an external digital trigger input. The trigger mode is software-selectable for edge- or level sensitive mode. You can configure edge-sensitive mode for either rising or falling edge. In level sensitive mode, you can configure for either high or low level. The default setting at power up is edge-sensitive, rising edge. In retrigger mode, you can set up repetitive analog input trigger events. The trigger is automatically re-armed after it is activated. Use software to set the A/D trigger count (the number of samples you want per trigger). Eight bidirectional digital I/O connections are included with OM-USB-1608G Series devices. Each digital channel is individually configurable for input or output. The digital I/O terminals can detect the state of any TTL-level input. You can configure for pull-up (+5V) or pulldown (0V) through a jumper. 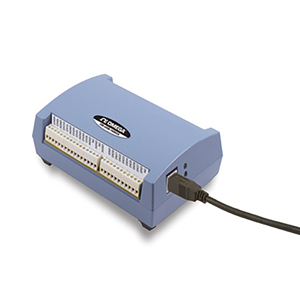 Each OM-USB-1608G Series device includes two 32-bit event counters for counting TTL pulses. The counters accept frequency inputs of up to 20 MHz. OM-USB-1608G Series devices have a PWM timer output that can generate a pulse output with a programmable frequency in the range of 0.0149 Hz to 32 MHz. The timer output parameters are software-selectable. OM-USB-1608G Series devices provide one external clock input and one external clock output for the analog inputs. The OM-USB-1608GX-2AO also has one external clock input and one external clock output for the analog outputs. The OM-USB-1608G modules ship with an impressive array of software, including the new TracerDAQ®, a fullfeatured, out-of-the-box data logging, viewing, and analysis application. Driver support and detailed example programs are included for Universal Library programming libraries for Microsoft® Visual Studio® programming languages, and other languages, including DASYLab®, and ULx for NI LabVIEW® (comprehensive library of VIs and example programs compatible with 32-bit and 64-bit LabVIEW v8.5 through 2012) and InstaCalTM installation, calibration and test utility-powerful solutions for programmers and nonprogrammers alike. These modules operate under Microsoft Windows® XP (32-bit only) and VISTA/7/8 (32-bit and 64-bit) operating systems. (SWD-TRACERDAQ-PRO). A comparison of some of the features included in TracerDAQ vs TracerDAQ PRO is shown on the PDF. Host computer is reset, powered on, suspended, or a reset command is issued to the device. The analog output terminals are internally routed to the analog input circuit. For best calibration results, disconnect any AOUTx connections at the terminal block prior to performing AOUT calibration. Trigger Mode: Software configurable for edge or level sensitive, rising or falling edge, high or low level. Power on default is edge sensitive, rising edge. AxCKO: Outputs the internal sampling clock (D/A or A/D clock) or the pulse generated from AxCKI when in external clock mode. Nota: Comes complete with a 1.8 m (6') USB cable, software and operator’s manual on CD.